Field Archery involves shooting at targets of varying (and often unmarked) distance, often in woodland and rough terrain. A field course is made up of either 24 or 48 targets depending on the round being shot. 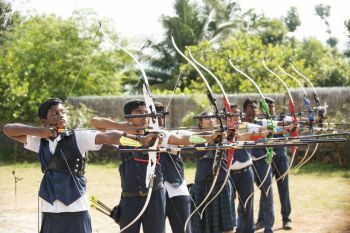 The archer is required to shoot either three or four arrows at each target. Distances range from 10 to 60 metres and target face sizes vary from 20 to 80 centimetres.